The controversy is dead, dead, dead, and far be it from me to bring it up at this late, but I think the pre-release outrage in the United States over The Great Wall is telling. Matt Damon in a historical action movie set in 11th Century China? Must be a pandering White Savior gesture, went the logic. And this interests me for the assumption underlying it - nothing to do with white superiority in cinema, but with the immediate 1+1=2 conclusion that if Matt Damon is in an action movie, then he must de facto be the solitary lead, because is that is how movie stars, and action movies, work. 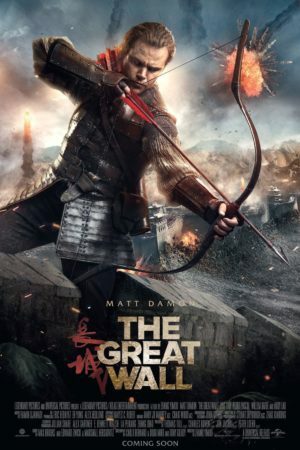 In fact, Matt Damon isn't the lead of The Great Wall because The Great Wall doesn't even have a lead, not really. The film is about collective heroism, much like the later Chinese action movie import Wolf Warrior II, and I concede that it's reckless to suggest that two movies that aren't really unified in any way form some kind of trend. Still, how is one supposed to avoid comparing the only two Chinese films of any note to make it to U.S. theaters in 2017 (The Great Wall was a Chinese-American co-production, but the bulk of its production budget, and by far the bulk of its box-office returns, came from China), particularly when they're doing something at heart similar: treating a quintessentially Hollywood genre with a perspective that is decidedly non-Hollywood, and replacing the lone hero with a group of heroes working together as a well-maintained unit. It is precisely by not remaining a lone savior that Damon's character ends up becoming one of the good guys. So that's interesting, anyway, and I daresay admirable. It is the only thing about The Great Wall that earns either of those adjectives. The film takes place in the 11th Century, after the time that news of gunpowder had reached Europe, but before Europeans had successfully traded for that most destructive of inventions. It is, in fact, a European mission to arrange such a trade agreement that The Great Wall initially concerns itself with: a good-size team of mercenaries has just arrived in the portion of modern China then under control of the Song Dynasty emperors. But we only need to worry about two of them: William Garin (Matt Damon, sporting a highly variable accent that spends a plurality of its time at or near southern Ireland) and Pero Tovar (Pedro Pascal), the only two who survive an attack from some large, unseen monster, leaving behind no evidence of its form other than a forelimb William is able to chop off in the fray. Upon arriving at the Great Wall (which didn't exist in its modern form yet, but that's just about the least of the films offenses against the historical record, as you'll see in a second), the two Westerners are taken prisoner, and here we learn that, for all you've heard about how the Wall was built to keep out the horse nomads from the north, it was actually designed to stop the invasion of demon lizards from outer space that happen every sixty years (see?). That's... colorful. Actually, that's something I'd be pretty much onboard with - if you're going to bastardise history, you might as well bastardise history and have done with it. And alien lizard monsters are certainly going all the way into madcap genre fun. The problem is that The Great Wall isn't fun in any other way. For one thing, it looks like crap - and this despite having not one, but two master-level cinematographers on the case, Zhao Xiaoding (his seventh collaboration with director Zhang Yimou, stretching back to the gorgeous House of Flying Daggers and Riding Alone for Thousands of Miles) and Stuart Dryburgh (who has shot many amazing-looking movies, but you only need The Piano to make the case), who are nonetheless helpless to save the film from its post-production bath in thick digital blues and greys, leaving some otherwise fine, dusky interiors feeling a bit like a video game level. There is one unabashedly great bit of cinematography: a fight scene taking place in a thick fog, rendering everybody as half-desaturated figures when they're not smudgy silhouettes. But even worse than the slightly over-digital colors are the aggressively digital monsters, which look appalling. 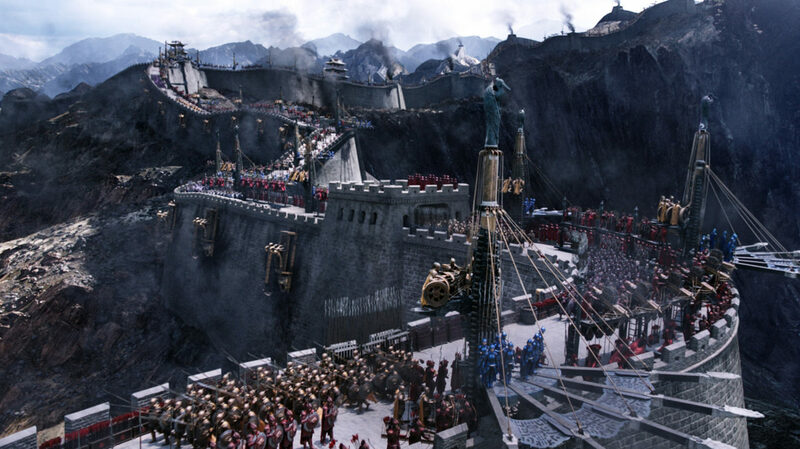 Unlike a lot of these failed experiments where the Chinese film industry attempts to go toe-to-toe with Hollywood on the visual effects front, The Great Wall actually relied on Hollywood to provide its digital beasties - ILM was the main effects house, or at least the first one credited - which hasn't helped any with the finished product. The creatures look dreadful, and the longer the film goes on, the more extensively it relies on them. This proves nearly fatal to the action scenes, which is a damn shame, because the action is generally well-choreographed; the fog scene is easily the best, probably because it's the one where we don't have to see the enemy as more than just grey shapes. But there are ideas throughout all of the many sight scenes that feel like they could be doing something terrific, if only the CGI wasn't letting them down. The film also suffers from some inscrutable storytelling, not just at the level of the screenplay (the script and story were written by no fewer than six credited individuals, all English-speakers, and it feels like a slurry assembled by committee). The basic flow of scenes is mangled; more than once, right in the middle of a sequence, I'd perk up and realise that I had no idea how we got here from where we were five minutes ago. Maybe language was a problem: the film is mostly in English, a language that Zhang Yimou has rarely worked in, and according to all the interviews I could track down, he doesn't speak it at all. At any rate, it's a clumsy chain of moments in baffling isolation, and it's depressing as hell to look back over the director's career from the 1990s until now: he made Ju Dou, he made Raise the Red Lantern, he made To Live, and somehow he managed to make something as confused about basic storytelling structure and human motivations as this. I'm making it sound worse than it is. Oh, it's bad. But it's not the worst thing. Jing Tian, as the leader of the special detachment training to stop the monsters, has the requisite gravity and seriousness and weight required to be the more-or-less protagonist of this flighty nonsense (and for her pains, Legendary Producers gave her a fragment of a role in their followup production, Kong: Skull Island; thus it ever was for overly talented non-American actors), and the more the film stays strictly within the military encampment, inculcating it's very particular sense of the community effort of training, and showing how the Europeans need to adapt to that community, the more it actually feels like it's about something, that there's a real psychological and sociological takeaway to be had. And then the shiny cartoon lizards pop back up to ruin it at all, and remind us that whatever merits this project might have had, that would require it to be a well-made version of a well-written script, and it just ain't that.